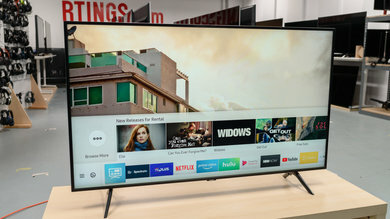 The Hisense H9E Plus is one of Hisense's top TVs for 2018, and it offers good mixed-usage performance. It has an excellent native contrast ratio and produces very deep blacks, but has a bad local dimming feature that doesn't improve dark room performance much. It has a good wide color gamut and very good motion handling. 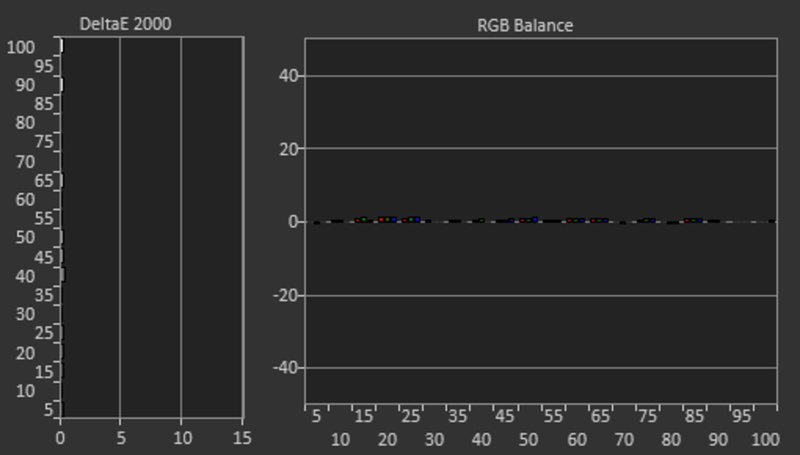 It supports HDR, but unfortunately it isn't bright enough to produce bright highlights, so the effect is lost a bit. 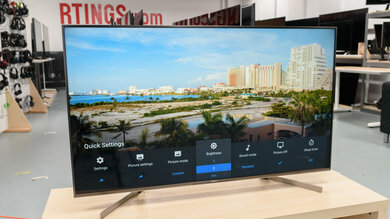 Note that this is a different TV from the Hisense H9E. The Hisense H9E Plus has a decent design. 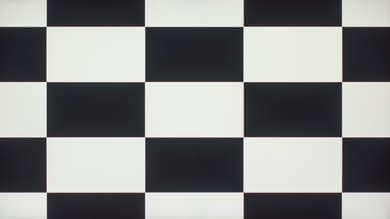 The borders are thin and it has a modern look that should fit well in most rooms. 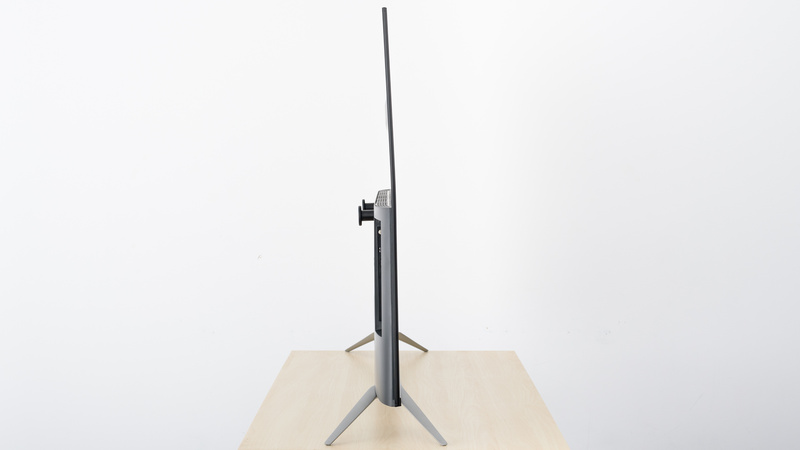 The stand is sleek and metallic, but it is nearly the full width of the TV, which could cause issues depending on the width of your table. 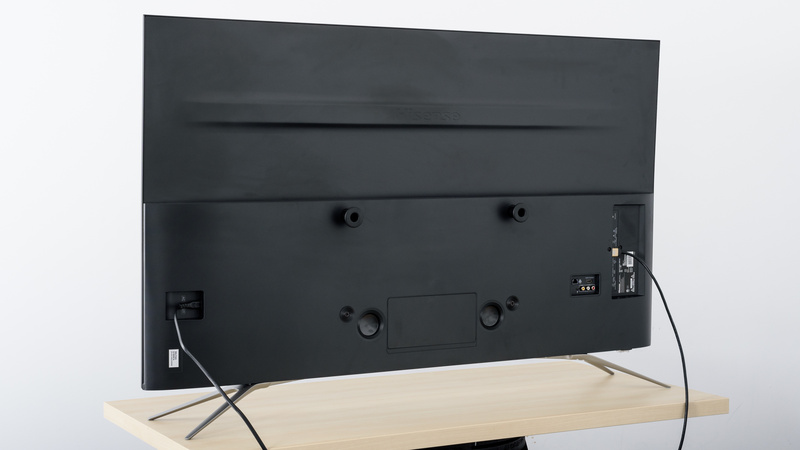 There is no dedicated cable management, but there are two plugs that come pre-installed in the top VESA mount holes that can be used to guide cables around the back. 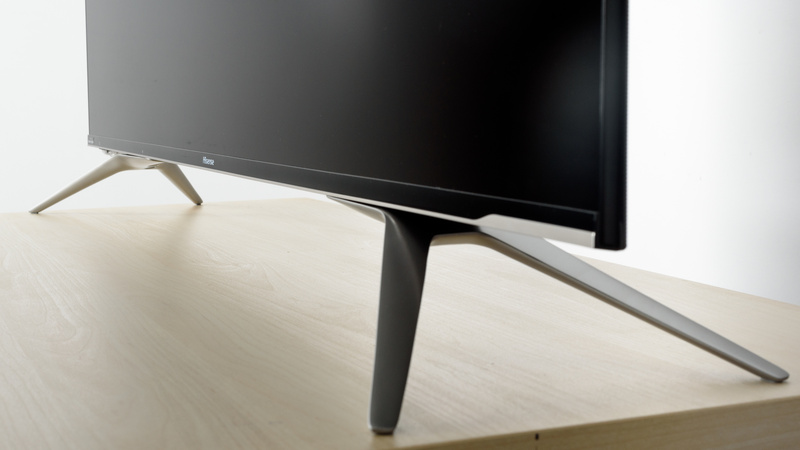 The stand supports the Hisense 55H9E Plus well, but is nearly the full width of the TV. The legs cannot be reversed. 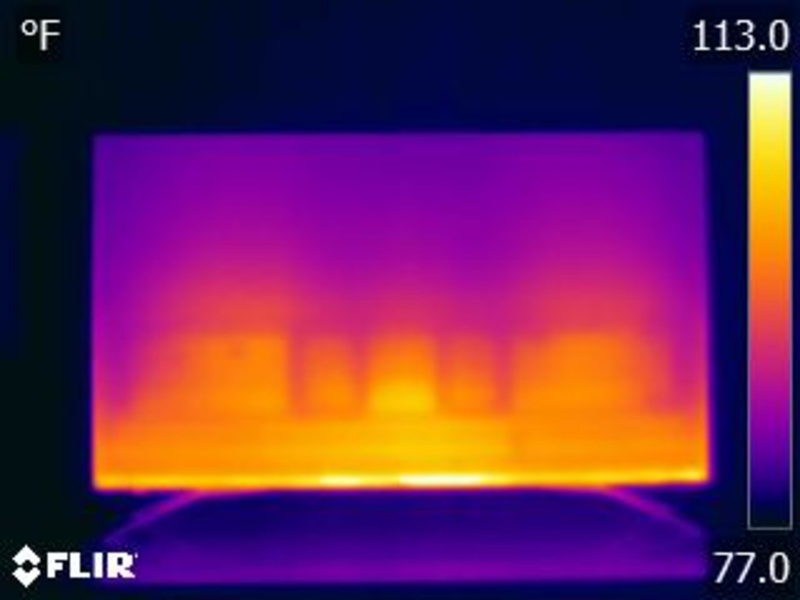 Footprint of the 55" TV stand: 45.3" x 8.9"
The rear of the TV is made of plastic and has a textured finish. There are two plugs that come pre-installed in the top VESA ports; we're not quite sure what these are for but they could be used to route cables around the back, as there is no other cable management. These plugs must be removed in order to VESA mount the TV. Very thin borders. 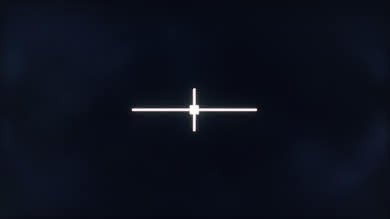 There is no gap between the edge of the border and the start of the screen. The main screen is very thin. 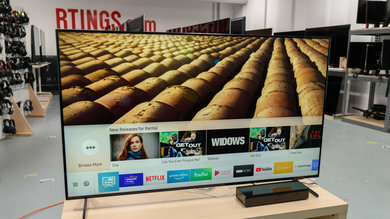 The design is similar to the LG OLED TVs like the C8 and B8, with a thin top screen portion, and all the electronics housed in a thicker bottom portion. 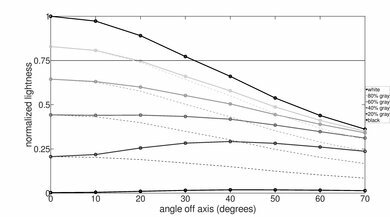 At the transition between the thicker bottom portion and the thin top part, our unit is bent backward. We don't know if this is intentional, a defect, or if the TV was damaged when we installed the legs. 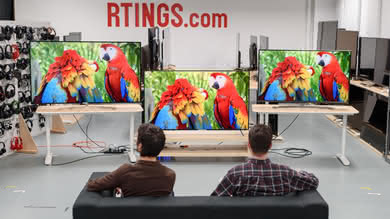 It isn't noticeable when watching TV, but care should be taken when attaching the legs. 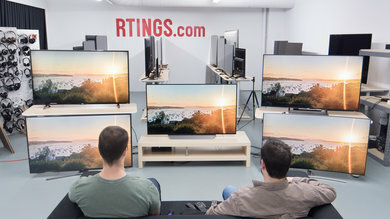 All of the electronics for this TV are clustered together in the bottom portion of the screen which causes it to get very warm, but this shouldn't cause any issues. Decent build quality. Except for the obvious bend in the screen, there are no serious defects in the TV or problem areas. 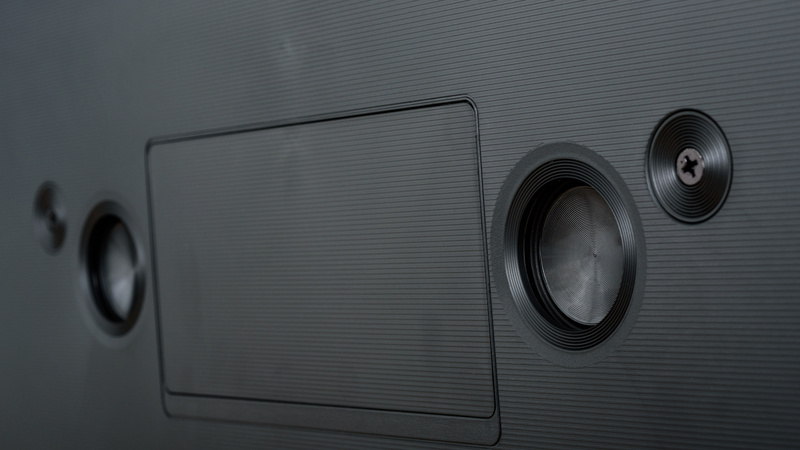 The large rings in this photo are speakers, but the smaller ones are covers over the VESA mounting points. The Hisense H9E Plus has good picture quality. 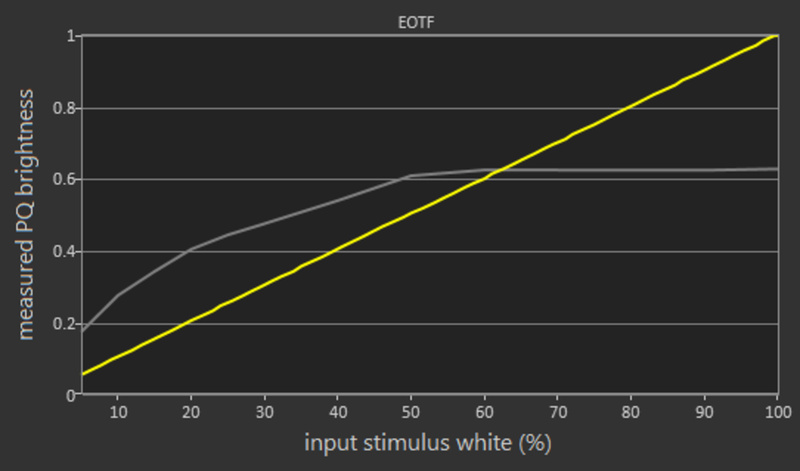 It has a great contrast ratio, so blacks look black in a dark room, but unfortunately, dark room performance is hindered by the bad local dimming feature. It hits good brightness levels with SDR content, but it can't overcome glare in a bright room and HDR is too dim to be fully enjoyed. Like most VA TVs, the viewing angles are poor. 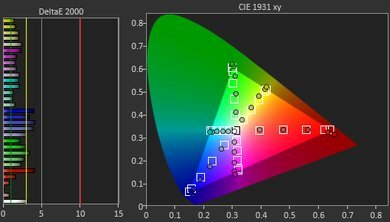 It produces a wide color gamut and decent color volume, similar to the TCL S517, but can't produce deep colors or bright blues. 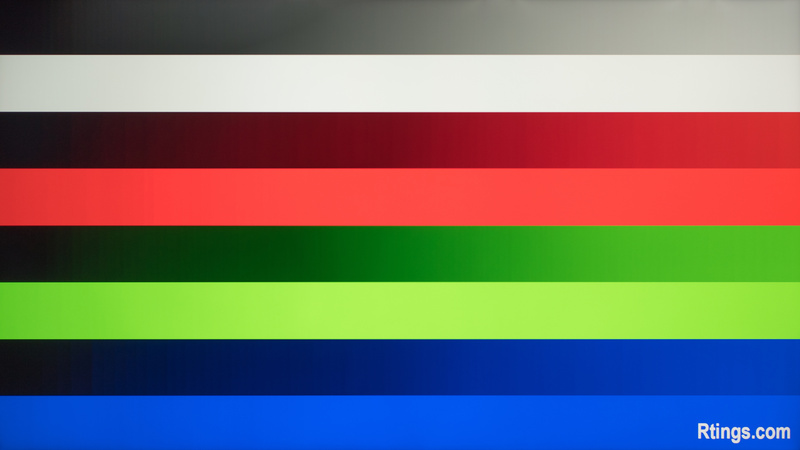 Large areas of uniform color show banding, especially in darker shades. The H9E Plus has an excellent native contrast ratio. The local dimming feature is effective in boosting the contrast even further, great for dark room viewing. The Hisense H9E Plus is edge lit and has a bad local dimming feature.  It is able to turn off dark zones to improve the contrast, but only in large vertical bands which can be distracting. Overall, it is more aggressive than the Samsung NU8000; producing deeper blacks but more blooming, and zone transitions are more evident. Decent SDR peak brightness. 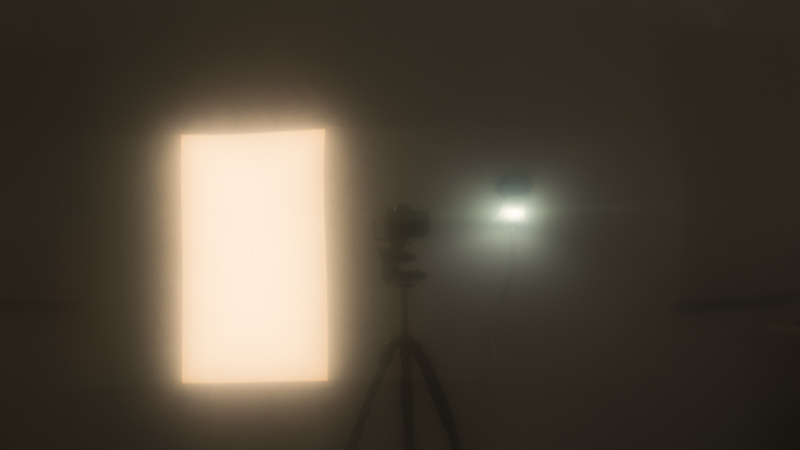 The H9E Plus isn't bright enough to overcome glare in a bright room but is bright enough for a dimly lit or dark room. There is very little variation in screen brightness based on content, which is good. Sub-par brightness in HDR. 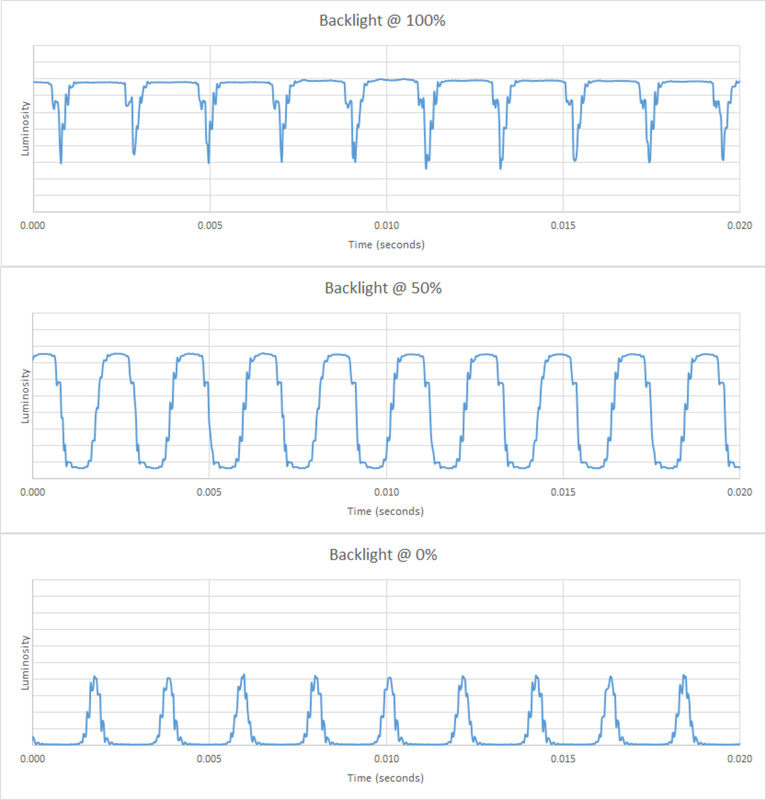 HDR content is noticeably dimmer than SDR. There is very little benefit to watching content in HDR on the H9E Plus. Overall brightness is fairly consistent with varied content, and some small highlights are boosted in some scenes. 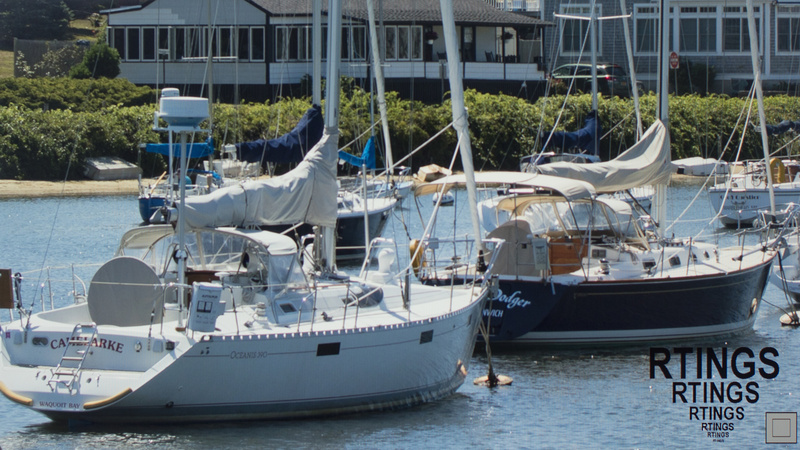 If you find HDR content too dim, see our recommended settings for HDR here. The Hisense H9E Plus has good gray uniformity. 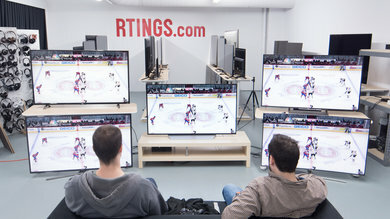 Some small bands are visible throughout, but these shouldn't be distracting when watching sports. The sides of the screen are noticeably darker than the rest, but this shouldn't bother most people. The Hisense H9E Plus has bad viewing angles.  Even slightly off center, the black levels increase significantly and the image appears darker. 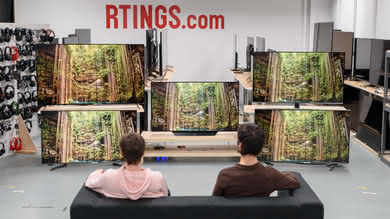 This is a problem if you have a wide seating area, or even if you are sitting too close to the TV, as the edges of the screen will be much darker than the rest of the screen. Decent black uniformity.  There is some backlight bleed visible across the screen. Enabling Local Dimming reduces the backlight bleed, but there is still some clouding visible. Good reflection handling. 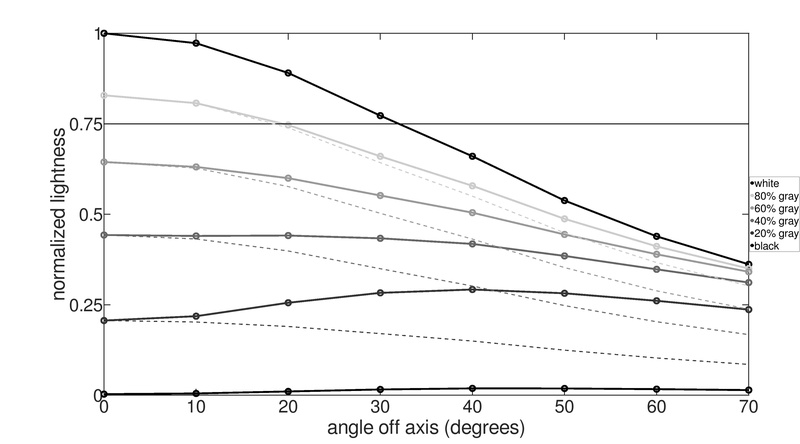 Most light sources are reflected clear, but significantly dimmer. 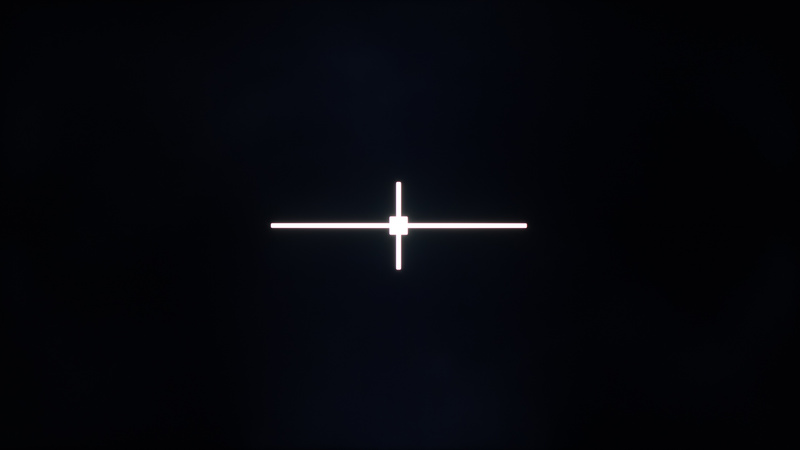 Reflections are not diffused across the screen. Excellent calibration out of the box. 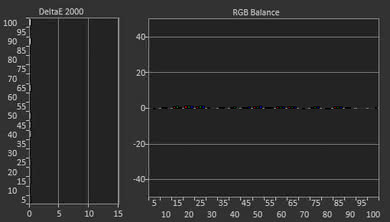 The most accurate results are with the 'Calibrated' Picture Mode. The white balance is very good, and while the color error is a bit higher, most people won't notice the errors enough to benefit from a professional calibration. 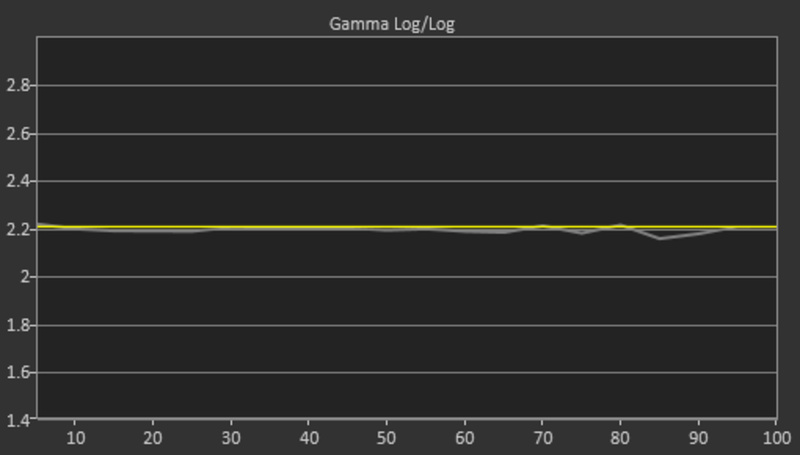 Gamma is a bit darker than the target of 2.2. After calibration the accuracy is nearly perfect. White balance is nearly perfect, but color inaccuracy is still a bit high, although most people won't be able to notice it. 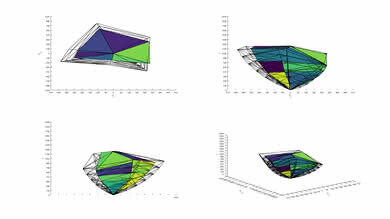 The calibration system is very sensitive; small changes result in a significant shift in color accuracy. 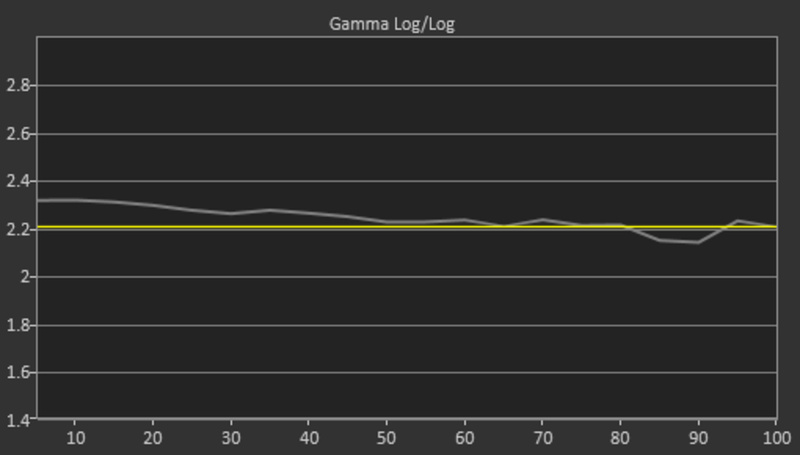 The gamma curve is nearly perfect. Low resolution 480p content looks good, with no obvious over-sharpening or artifacts. 720p content is played back smoothly with no obvious issues. 1080p content, like from a Blu-ray or non-4k game console, looks almost as good as native 4k content. 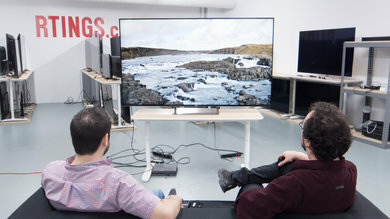 4k content looks good with no observable issues. The H9E Plus has a good, wide color gamut. We test with 75% stimulus colors which are very bright, and at this brightness the TV's color accuracy isn't great; however when we send 50% stimulus colors which are less bright the color accuracy is better, with both P3 and Rec 2020 colors. The HDR EOTF curve in the HDR Standard picture mode is brighter than the target PQ curve, so HDR content will look brighter than intended. 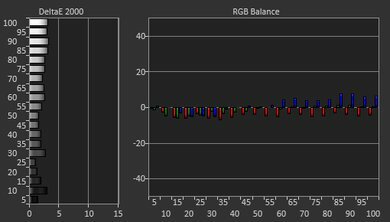 If you want to make HDR content even brighter you can raise the Contrast to '100', which brightens the EOTF, and if that's still not bright enough you can also set Active Contrast to 'Medium'. The EOTF in the HDR Game picture mode is nearly identical to that of HDR Standard. The Hisense H9E Plus produces decent color volume, similar to the TCL S517. 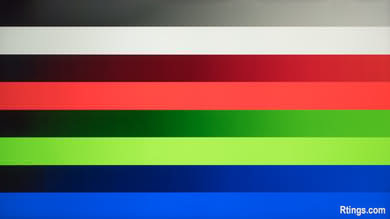 It can't produce deep colors or bright blues very well, but produces red and greens almost as bright as pure white. There is significant banding in darker shades. This is noticeable in large areas of similar color, especially in darker shades. Even immediately after our 10 minute test, there was no temporary image retention. The Hisense H9E Plus has very good motion handling. 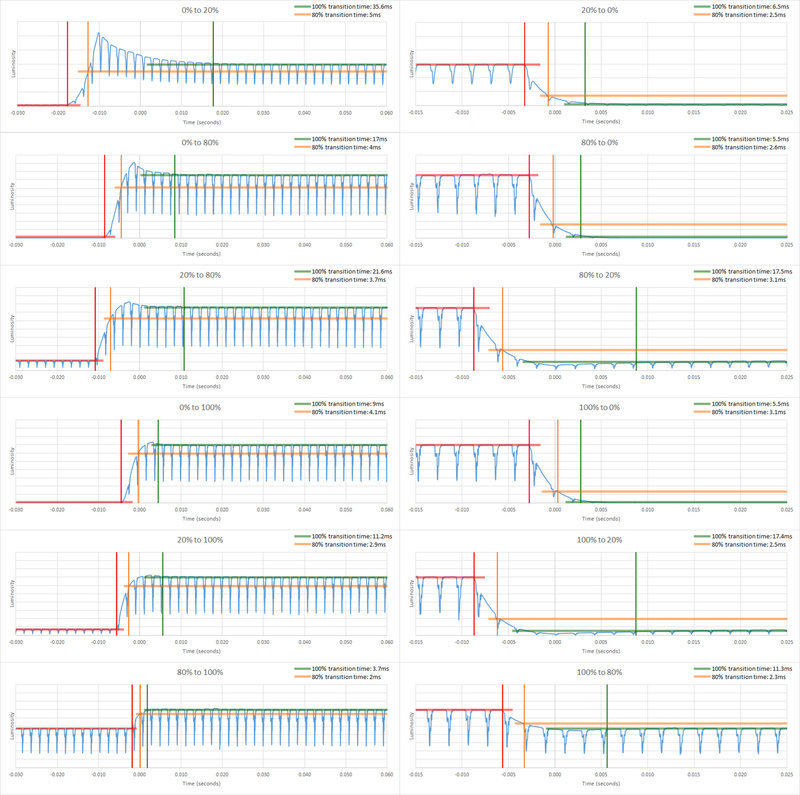 The pixel response time is very fast. 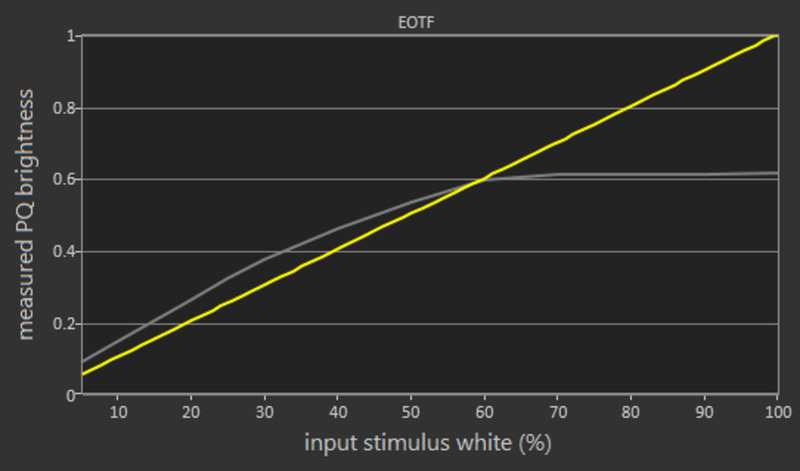 It can interpolate lower framerate content up to 120 Hz, although some people might not like the Soap Opera Effect that this introduces. The motion interpolation feature can also be used to remove judder from 24p sources, without adding any soap opera effect. 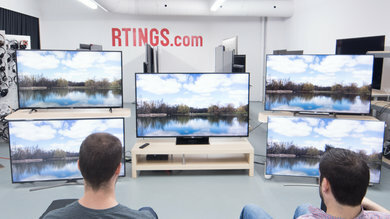 The backlight uses PWM dimming at all brightness levels, which might bother some people, but the TV cannot reduce the flicker frequency to improve motion clarity. The Hisense H9E Plus has an excellent fast response time. 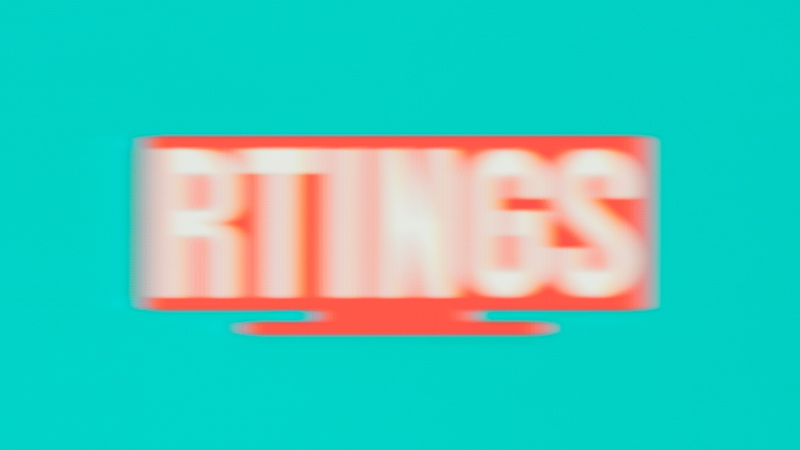 There is significant overshoot in some transitions, this can cause some artifacts in some scenes and can be seen in the motion blur photo. Most down transitions undershoot their targets before leveling out but this is fairly minor and most people won't notice it. The Hisense H9E Plus uses PWM for the backlight at all levels. The frequency is quite high, and most people shouldn't notice it. 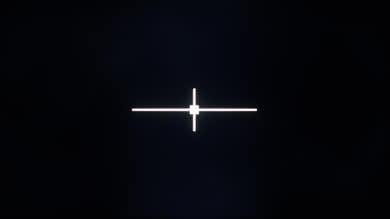 The H9E Plus does not have an optional Black Frame Insertion feature. The Hisense H9E Plus can interpolate lower frame rate content up to 120 fps. 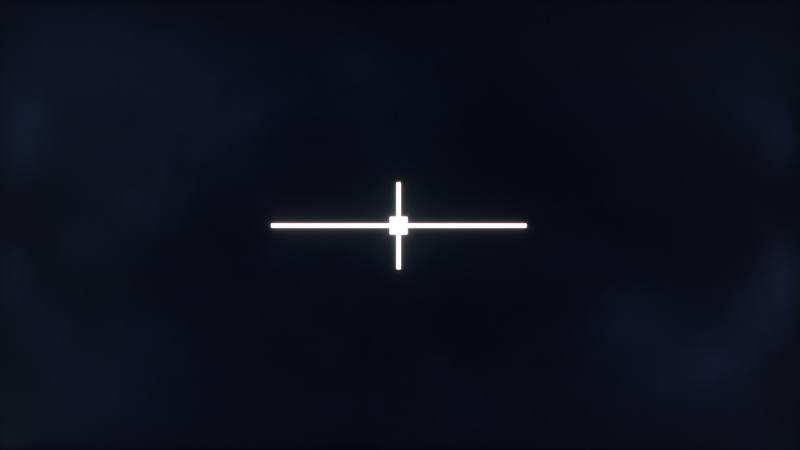 The option for this is called Motion enhancement. The 'Film' setting can be used to remove judder without adding any extra interpolation or Soap Opera Effect. The 'Smooth' setting provides the maximum amount of interpolation. 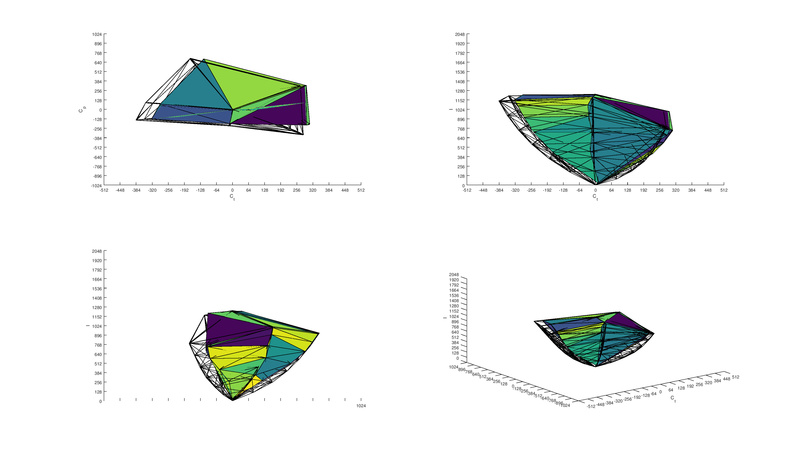 With higher levels of interpolation, there are more artifacts during fast motion. When watching 24p movies, from a Blu-ray for example, there is some stutter, since each frame is held static on the screen. 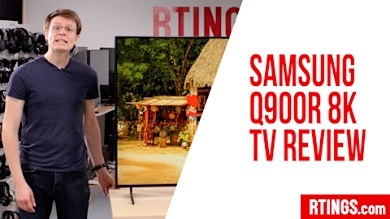 The overall stutter of this TV is decent, but it can be noticeable to some people, especially in wide panning shots. 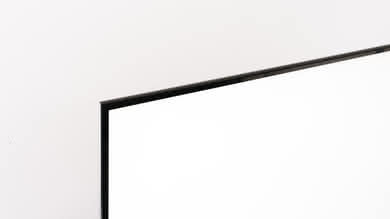 The TV can remove Judder from all sources, but only when Motion enhancement is set to 'Film'. This mode of interpolation removes judder without adding any extra interpolation or soap opera effect. The Hisense H9E Plus does not support VRR. We tested this with a PC and with the Xbox One S.
The Hisense H9E Plus has great low input lag, perfect for gaming, and accepts a variety of resolutions, including 4k and 1440p. 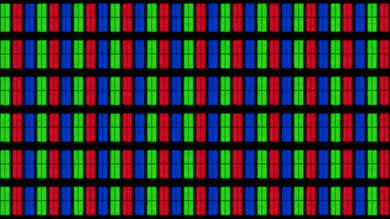 Unfortunately, despite the 120 Hz panel, it cannot display a 120 Hz signal and instead drops every other frame. It also cannot properly display a 4:4:4 signal, which is disappointing for use as a PC monitor. Great low input lag. 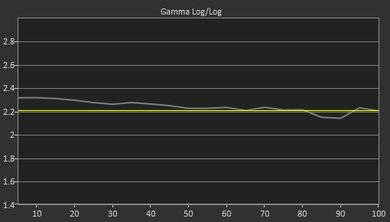 The 4k input lag is a bit higher than similar models from this year. 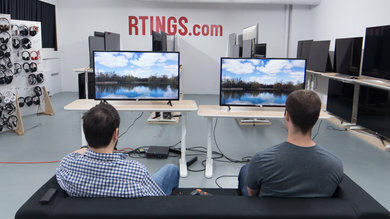 1080p input lag is very low, great for gaming with older consoles. 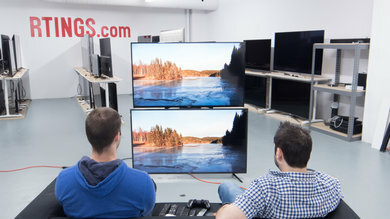 The H9E Plus cannot display 120 Hz content from any source. 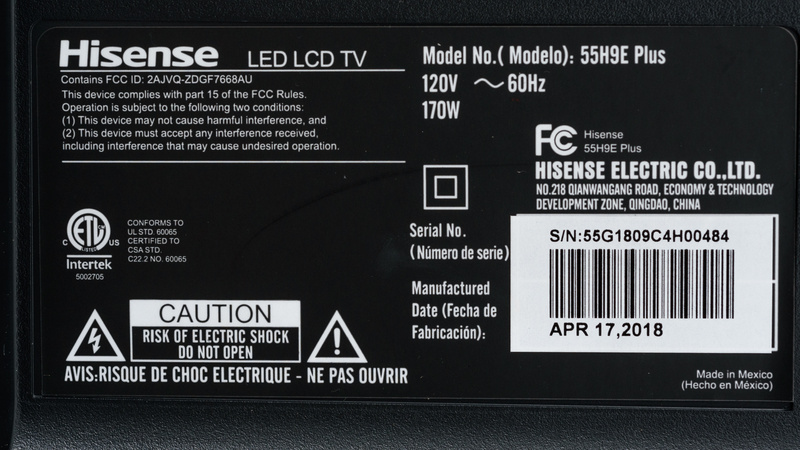 The Hisense H9E Plus can receive a Chroma 4:4:4 signal, but can't display it correctly. 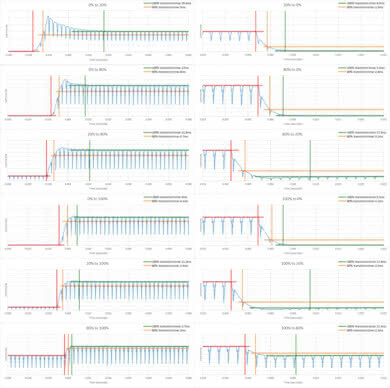 When we sent our test image in 4:4:4, every vertical line under the text should display as the same color, but they don't. This doesn't have a significant impact under normal usage, but when used as a PC monitor, text isn't clear. 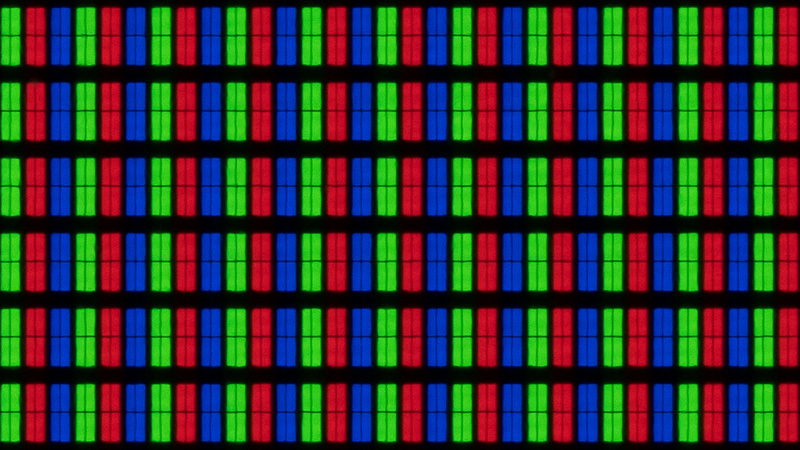 The TV has a native 120 Hz panel, but when a 120 Hz signal is sent it drops every other frame. 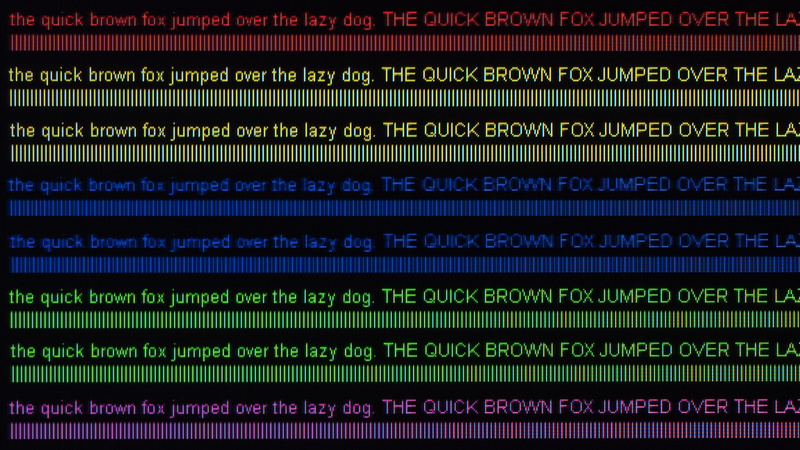 The only way to display at 120 Hz is to enable motion interpolation. 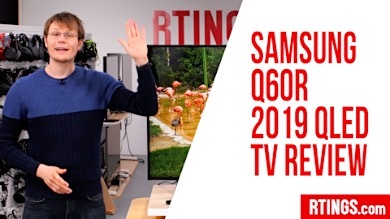 This is similar to last year's Samsung Q7F or Q8C. Most of the inputs are towards the side. 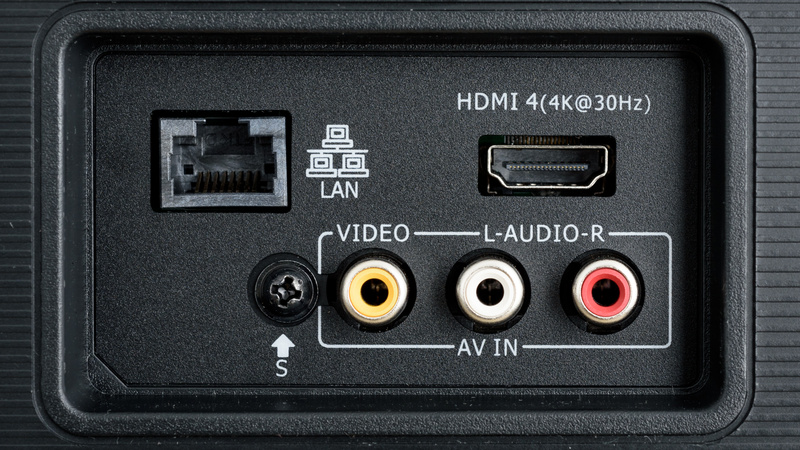 HDMI ports 3 & 4 are lower bandwidth ports that are limited to 4k @ 30 Hz, or 4K @ 60 Hz 4:2:0. There is no component input, but there is a dedicated composite input that does not require a breakout cable. 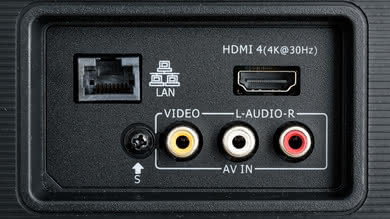 HDMI control must be enabled under the Consumer Electronic Control (CEC) section of the Inputs settings menu for the Audio Return Channel to work. The Hisense H9E Plus has an average sound quality. This TV doesn't produce a lot of bass, so it won't be ideal for content that requires a powerful and deep bass. However, dialog is decently clear and intelligible on them, and it gets loud enough for most usage scenarios. 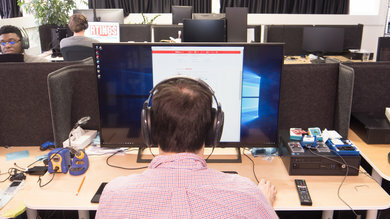 For a better sound, dedicated speakers or soundbars are recommended. 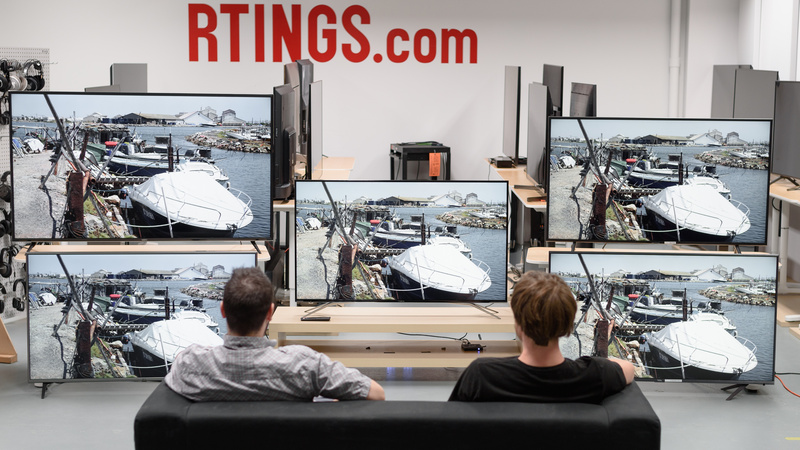 It should be noted that we tested the 55" model. 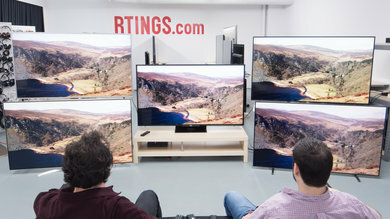 The 65" model has different audio hardware and software (15W vs 10W and dbx-tv processing) which we did not test. The frequency response is mediocre. The LFE (low-frequency extension) is at 90Hz, meaning this TV doesn't produce any sub-bass, so it lacks the thump and rumble common to bass-heavy film scores and video games. It also lacks quite a bit of mid-bass, so it won't have a lot of body or punch to its low-end. 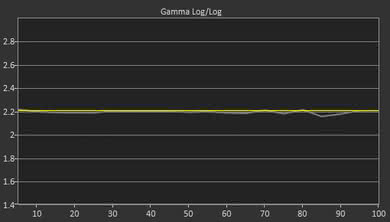 However, the frequency response above the LFE point is decent, so dialog will be decently clear and intelligible. Additionally, this TV gets loud-enough for most situations, without too much compression and pumping artifacts under heavier loads. Also, this TV doesn't have a digital room correction system. 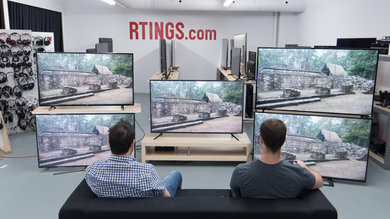 We tested the 55" model. 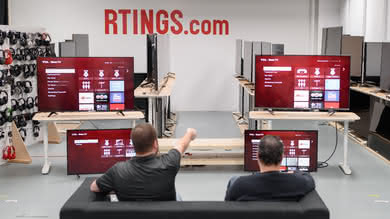 The 65" model has different audio hardware and software (15W vs 10W and dbx-tv processing) which we did not test. The distortion performance is good. The overall amount of THD produced at 80dB SPL is with good limits. Also, there's not a big jump in THD at max SPL either, which is good. The Hisense H9E Plus has a very good smart interface. 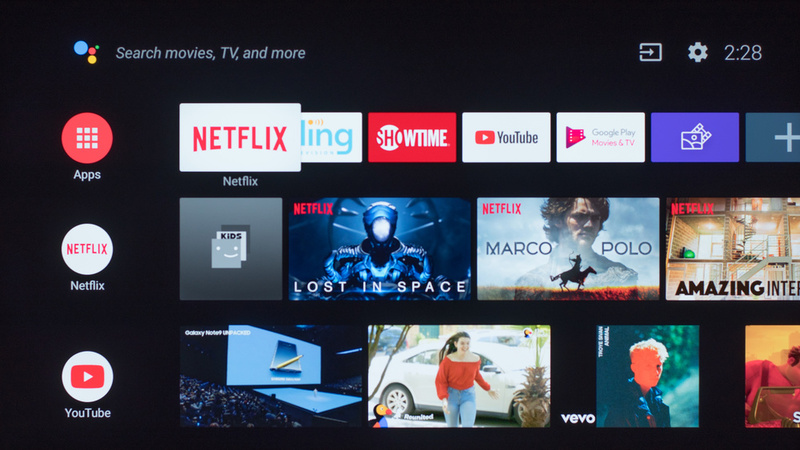 It runs the latest version of Google's Android TV. The main interface has a modern design and is very fast. The included Google Play Store provides one of the widest assortment of apps available on any Smart TV. 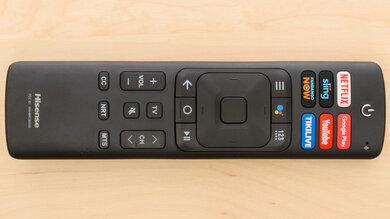 The remote is very basic but provides quick access to most functions. 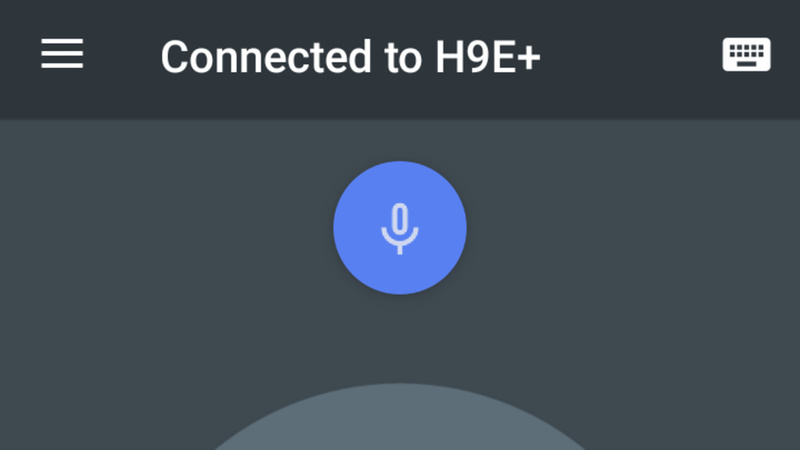 Unfortunately, we weren't able to get the official companion app to work but there is a Google app that works, and it can interface with any Amazon Alexa device for voice control of almost all functions, including power. The interface is very fast and easy to use. 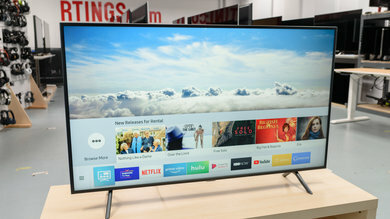 The Hisense H9E Plus uses the latest version of Android OS for TVs, which uses a simpler interface than the older version found on some Sony TVs like the X900F. The interface is well laid-out and easy to navigate, and it is very fast to access basic settings or open apps. We encountered a difficult bug during our testing, find out more here. The Hisense H9E Plus does not have any ads, but there is suggested content on the home screen. This can be disabled in the settings menu. The Hisense H9E Plus comes preloaded with access to the excellent Google Play Store, which has one of the widest app selections of any TV platform. The preinstalled apps cover most uses, and they are fast and easy to use. 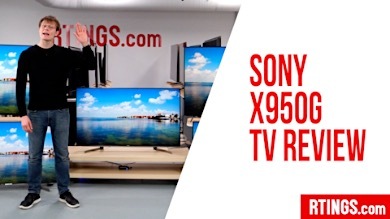 Unfortunately, like the Sony Android TVs, YouTube does not support HDR with the native app. 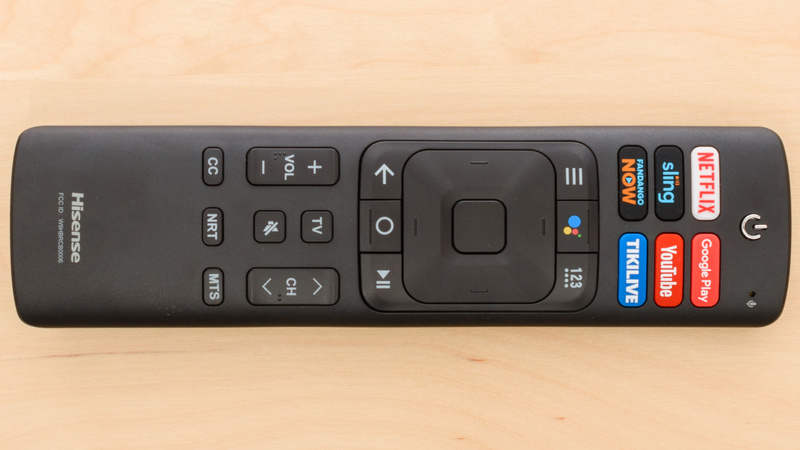 The included remote is good, but very basic. There are six dedicated buttons for apps that can't be reprogrammed. Google Assistant can be accessed via the remote and can search for almost anything. Volume and inputs can be changed by voice but the picture settings can't be. The H9E Plus can also interface with an Amazon Alexa device for voice control. There is an official Hisense remote app, but we were unable to get it to work despite the H9E Plus being listed as 'supported'. 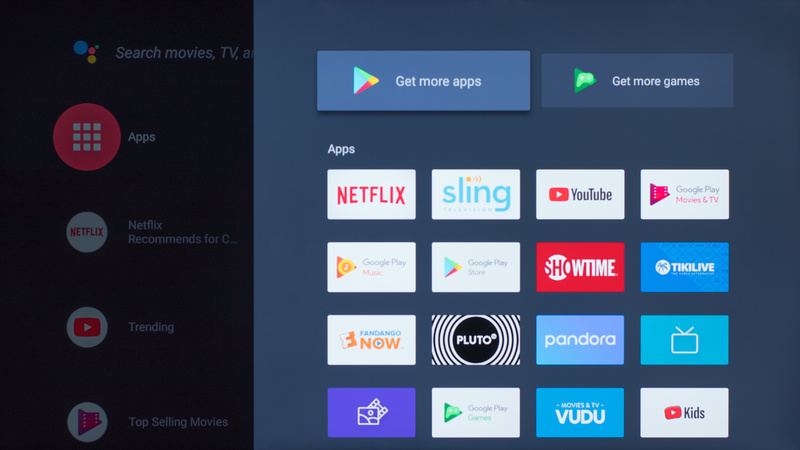 There is a Google Android TV app that can be used instead. 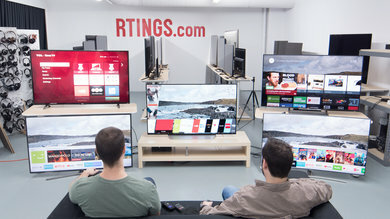 The Google remote app provides only basic support, replacing some of the buttons on the remote allowing for basic navigation of on-screen menus. 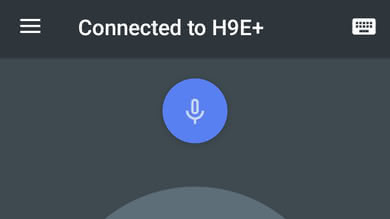 It can input text, but only in Android text boxes. 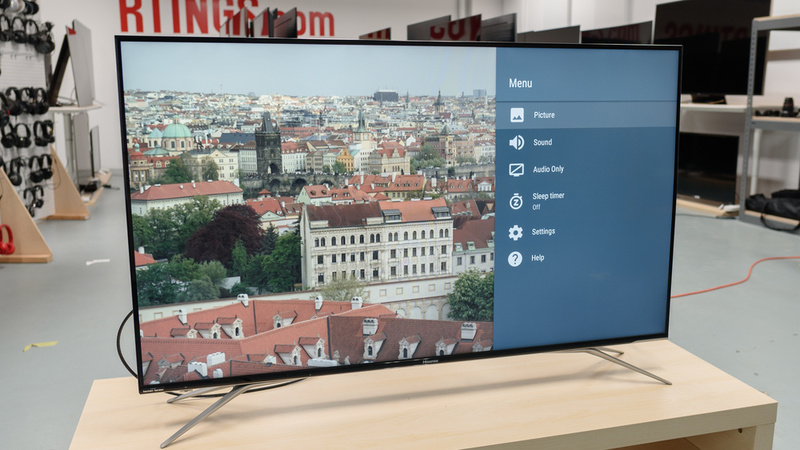 There is an option for voice command, and the TV detects that a request has been made, but no voice commands are communicated to the TV. This could be an issue on our end, and it is possible that this will be fixed with firmware and/or software updates. 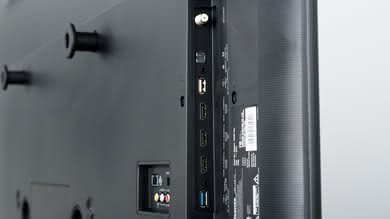 The TV can also be controlled via the physical joystick nub located under the screen. 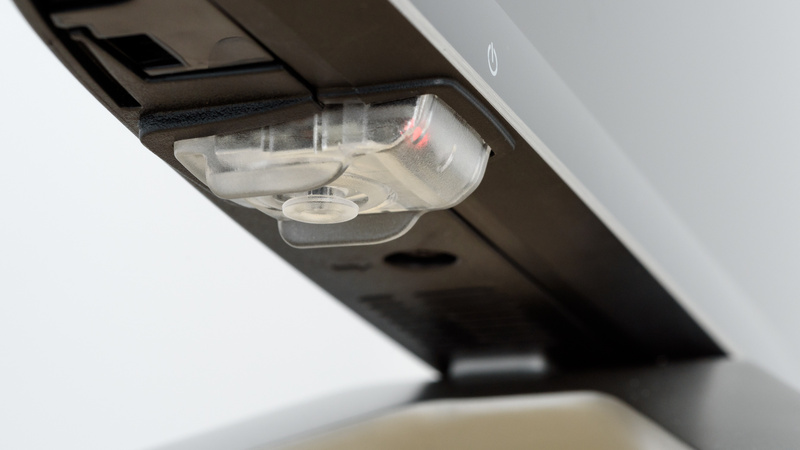 The joystick is easy to use and provides quick access to the inputs. 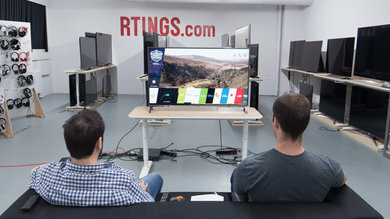 We tested the 55" Hisense H9E Plus, manufactured April 17, 2018. 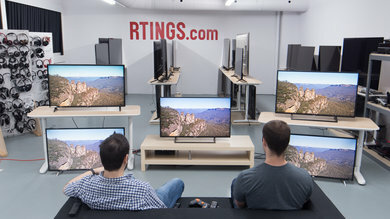 For the most part, we expect our review to be valid for the 65" (65H9E Plus) model as well. 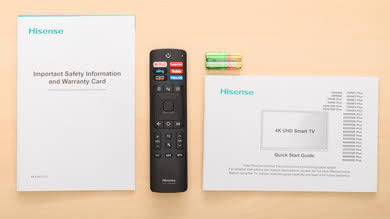 If someone comes across a different type of panel or if their Hisense H9E Plus doesn't correspond to our review, let us know and we will update the review. Note that some tests such as the gray uniformity may vary between individual units. 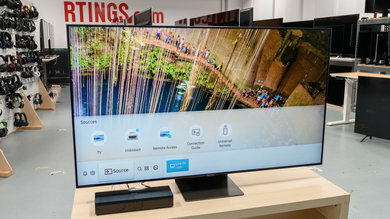 This is not the same TV as the Hisense H9E. 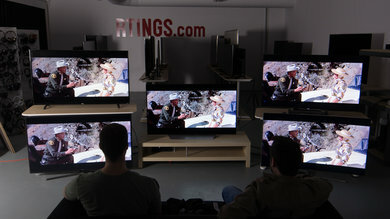 The H9E features full array local dimming, and has 4 HDMI 2.0 ports, but it is not expected to have a wide color gamut. 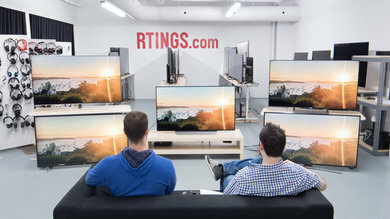 Top left: Vizio E-Series 2018 (E65-F0). 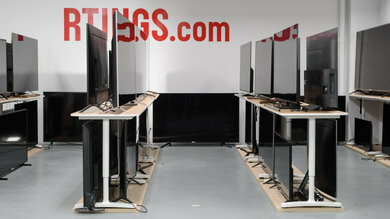 Bottom left: LG UK7700 (55UK7700PUD). Middle: Hisense H9E Plus (55H9E Plus). 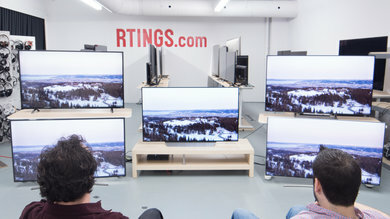 Top right: Samsung NU7100 (UN55NU7100). 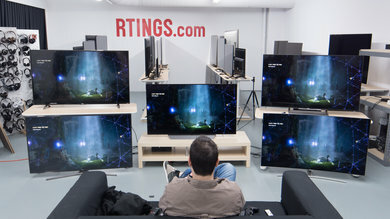 Bottom right: TCL R617 (55R617). Unlike our other photographs, this picture wasn't taken under a controlled environment, so do not draw conclusions from it. 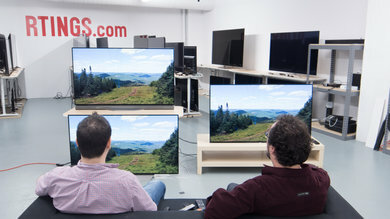 The Hisense H9E Plus is a good all around TV that offers decent performance for the price. The Samsung NU8000 is better than the Hisense H9E Plus. 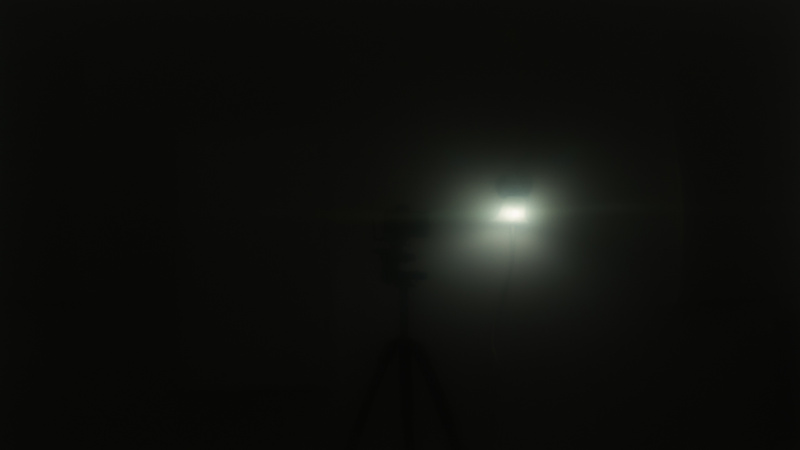 The NU8000 is much brighter in SDR and is able to overcome glare in a bright room. The NU8000 is a lot brighter in HDR and bright highlights stand out better. The NU8000 is more feature-packed than the H9E Plus; it can reduce the backlight flicker to improve motion clarity and it supports VRR and auto low latency mode, perfect for gamers. 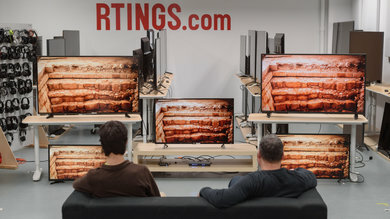 43" 49" 50" 55" 65"
Good TV for most uses. It has an excellent native contrast ratio great for movies. 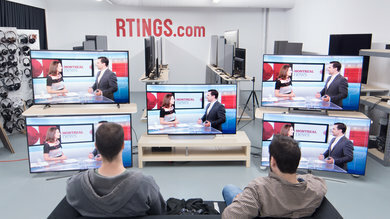 For TV and sports it has a fast response time and good peak brightness, but can't overcome glare in a bright room and has poor viewing angles. 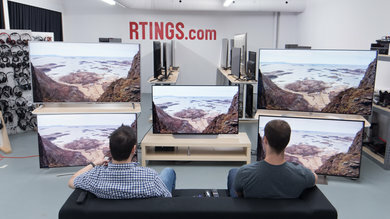 Very good TV for gaming, with low input lag, but gaming in HDR doesn't add much to the experience. While it can be used as a monitor, it doesn't properly support 4:4:4 so text is blurry. The Hisense H9E Plus delivers a good movie-viewing experience in a dark room. The high native contrast ratio means blacks don't look gray in a dark room, but unfortunately the local dimming feature is bad. The response time is excellent, and motion looks great. The TV can remove judder from all sources. 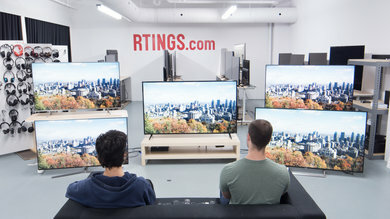 Good TV for watching TV during the day. It has good reflection handling and good SDR brightness, but it isn't bright enough to overcome glare in a really bright room. 720p and older TV shows are upscaled well without any artifacts. 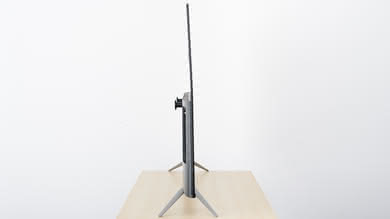 Unfortunately, the viewing angles are poor and it is best enjoyed from directly in front. Decent TV for watching sports during the day. The Hisense H9E Plus has good reflection handling and good SDR brightness, but can't quite overcome glare in a bright room. Motion looks great thanks to the fast response time. 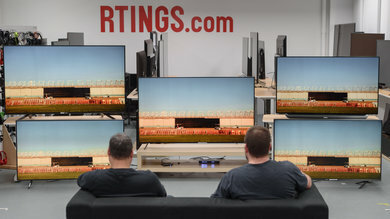 Unfortunately, the viewing angles are poor and this TV is best enjoyed from directly in front, so it isn't great for watching the big game with a group of friends. The Hisense H9E Plus is very good for playing video games. Input lag is very good, low enough for all but the most competitive gamers, and the response time is excellent, so fast moving objects are crisp and clear. 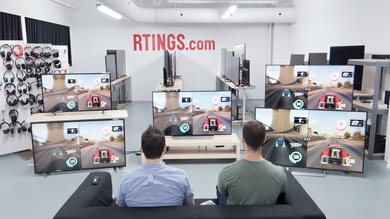 Unfortunately, it doesn't support any of the new gaming technologies like VRR or auto game mode. 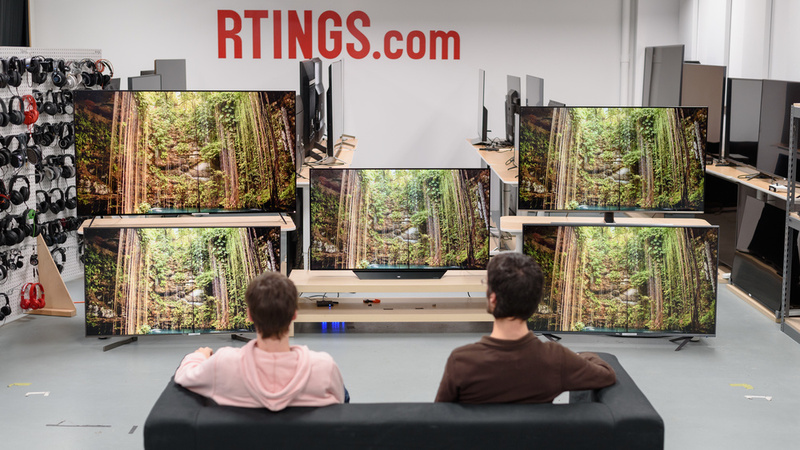 The TV delivers a good HDR movie experience, but HDR doesn't add much. 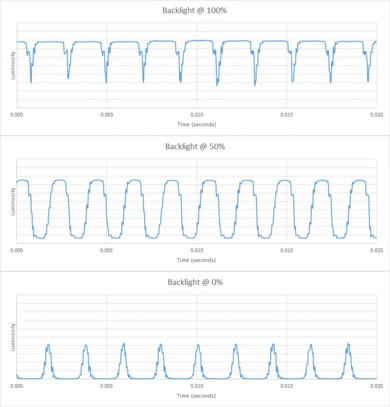 The excellent native contrast ratio is perfect for dark room viewing, but the local dimming feature is bad and it can't produce very bright highlights in HDR. It has a good wide color gamut and decent color volume. 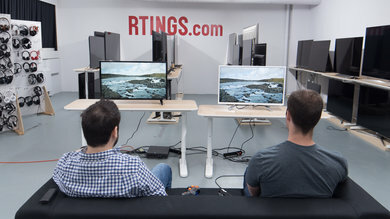 Good HDR gaming experience. Very good low input lag for gaming in 4k, and motion looks great thanks to the fast response time. 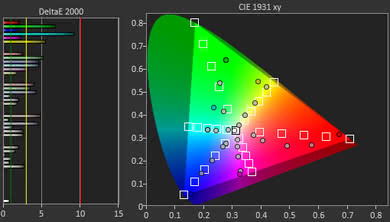 The H9E Plus produces a wide color gamut and has decent color volume. Unfortunately, HDR doesn't add much as it can't produce bright highlights and the local dimming feature is bad. 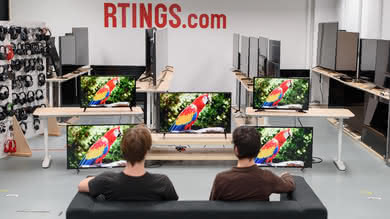 Decent TV for use as a PC monitor. 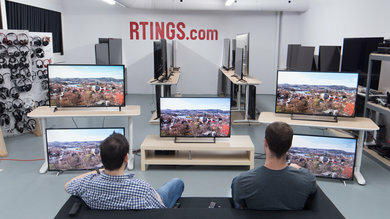 The TV has very good low input lag and an excellent response time. Unfortunately, the viewing angles are poor, and it can't properly display 4:4:4 color, so text always looks a bit blurry.